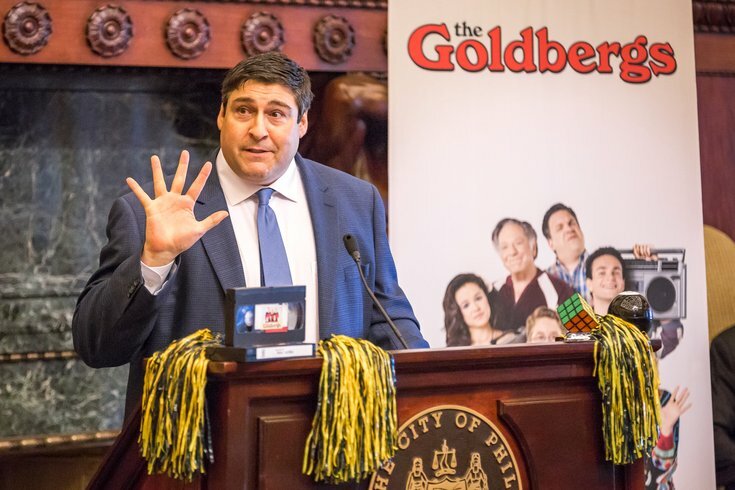 Philly-area native and producer of "The Goldbergs," Adam F. Goldberg speaks at a press event at City Hall, Friday, Sept. 15, 2017. For people outside the family circle, watching someone else’s home movies is about as exciting watching paint dry. But when Adam Goldberg, creator of the popular TV show, “The Goldberg’s,” took his family videotapes to Doug Robinson (executive producer of “Happy Madison,” “Rules of Engagement” and more), Robinson was glued to the tube, and slapping his knee with laughter. “This is a TV show,” Goldberg recalled Robinson saying. Goldberg, joined by several cast members of the show and the general manager of WPVI-TV, was honored Friday during a ceremony at City Hall. 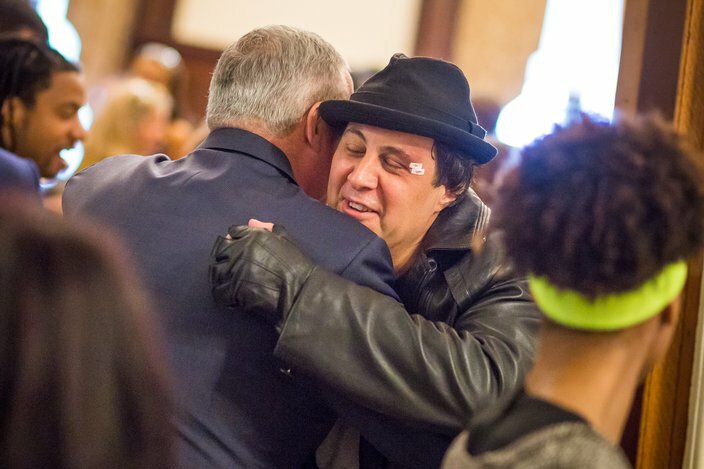 Mayor Jim Kenney paid tribute to Goldberg’s success on the Philly-inspired television show set in the 1980s, during the era of bangles, big hair, Boomboxes, Walkmans, fanny packs, Rubik’s Cubes and Nintendo. 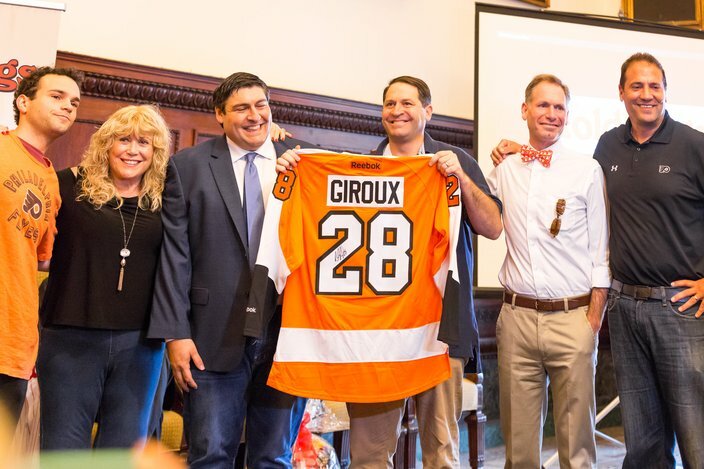 Philly-area native and producer of “The Goldbergs,” Adam F. Goldberg, (third from left), is accompanied by members of his family while being presented with a Philadelphia Flyers jersey by Comcast Spectacor public relations vice president, and Goldberg's former youth hockey coach, Ike Richman, right, at a press event at City Hall, Friday, Sept. 15, 2017. To celebrate the comedy’s broadcast syndication launch and recently filmed 100th episode, the Philly native and his TV brother, “Barry,” played by actor Troy Gentile, were given Flyers gear and thanked by City Representative Sheila Hess, who sported a yellow sweatband in the spirit of the occasion. Goldberg admitted it took him a decade to find the courage to write the show, fearing no one would want to see a comedy based off his real-life experiences growing up in the city’s suburbs. “I was 100 percent positive that no one would want to spend their free time watching what went on in the Goldberg household,” he said. Rocky Balboa impersonator, Mike Kunda, greets Philadelphia Mayor Jim Kenney at City Hall, Friday, Sept. 15, 2017. “The Goldberg’s” milestone 100th episode airs this week on PHL17 in Philadelphia and on Tribune Stations nationwide. “The Goldberg’s” will be starting its fifth season on Sept. 27 on ABC. During tonight’s Phillies’ game against the Oakland A’s, fans will be treated to tons of 80s fun for “The Goldberg’s Night” at Citizens Bank park, where Goldberg will throw out the ceremonial first pitch, Phillies-themed clips from the show will be featured on PhanaVision throughout the game, fans will receive a retro Phillies/Goldbergs slap bracelet.